The traditional Thai New Year, which takes place in April, is an opportunity not to be missed to discover a country in full swing. This period is called « Songkran ». This Sanskrit word means « passage » and refers to the arrival of the sun in Aries, the first astrological sign of the zodiac. 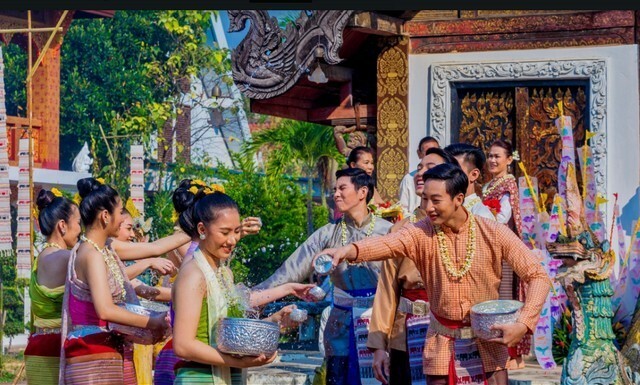 According to the solar calendar, Songkran is held on April 13 or 14, however the festivities can extend over the period from April 12 to 16, and sometimes even longer. Also known as the « Water Festival », Songkran is celebrated throughout the country. Today it is the most joyful and picturesque event in Thailand. On this occasion, many Thai Buddhists go to the temples to make offerings and receive blessings from the monks before returning home to their families. In a gesture of reverence and gratitude, they wash their elders’ hands with water scented with rose petals and jasmine. This water, within reach of children (and adults) becomes conducive to play and a water battle breaks out! 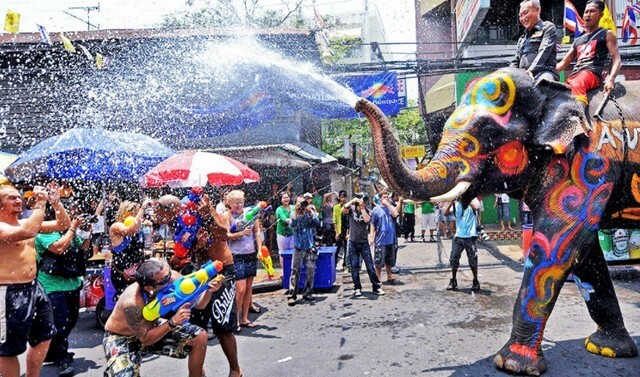 It is from there that Songkran has evolved over time to become the largest water battle in the world. Songkran is thus an exceptional moment where visitors can participate in solemn rituals and/or take part in the frenzy of water battles. This perfectly reflects the Thai mentality: respectful of traditions but also always ready to have fun! If you are lucky enough to be in Thailand for the Songkran period, the following tips may be helpful. Bangkok (April 11-14): For a cultural activity, treat yourself to a morning visit to Wat Benchamabophit (the Marble Temple), Wat Suthat (near the Great Swing) or Wat Ratchabophit (next to the Grand Palais). These magnificent royal temples are still frequented by local devotees. For water battles, go to Khao San Road, Phra Athit Road, Silom Road or Lumpini Park. Samut Prakan (April 20-22): In Phra Pradaeng district, the Mon ethnic community organizes several festivities including colourful parades, beauty contests for men and women and countless outdoor shows. Chiang Mai (April 13-15): Along the city’s walls and moats, everyone gets wet by the pick-ups that water everyone they meet. You can find refuge in the temples which are particularly well decorated in this period, with sand sheds, zodiac flags and colourful lanterns. 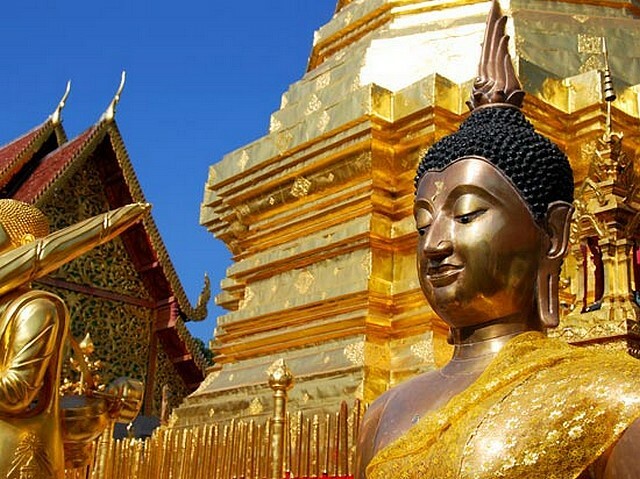 You can discover the temples of Wat Phra Sing, Wat Pantao, Wat Chiang Man and Wat Suan Dok. Lampang (April 13 and 14): 1h30 drive from Chang Mai or 1h flight from Bangkok. Take a horse-drawn carriage to visit the city centre, which is full of wonderful temples and heritage homes, all made of teak. Lampang is a timeless and off the beaten track place, ideal for celebrating Songkran as it was in the days of the Lanna kingdom. Loei (April 14-16): For frequent travellers, think of Na Haew. It is an unknown and remote village, but it organizes one of the most beautiful festivals in the northeast of the country. On the program: the magnificent processions of flower tours at Si Po Chai Temple. Then, let yourself be charmed by the city of Chiang Khan where you will surely find a cottage to rest on the banks of the Mekong River. The sunset over the river is magical. The beaches of Thailand: In the East, the islands of Trat (Ko Chang, Ko Mak, Ko Kood, etc.) and in the South, the islands of Trang (Ko Muk, Ko Kradan, Ko Ngai, etc.) offer emerald, warm and crystal clear waters. Or Khanom Beach, in the province of Nakhon Si Thammarat, facing the Gulf of Thailand, a quiet spot for pink dolphins from Irrawaddy.